In a judgment received today, a tribunal has ruled in favour of Netpol and said that the police cannot rely on safeguarding national security as a reason for refusing to release any information on how often opponents of fracking are referred to a secretive ‘de-radicalisation’ programme controlled by counter-terrorism officers. In May the Information Rights Tribunal in London heard our appeal against the Information Commissioner, who had backed the decision of five police forces in the north-west to reject our requests for information about ‘Channel’, part of the government’s Prevent strategy. 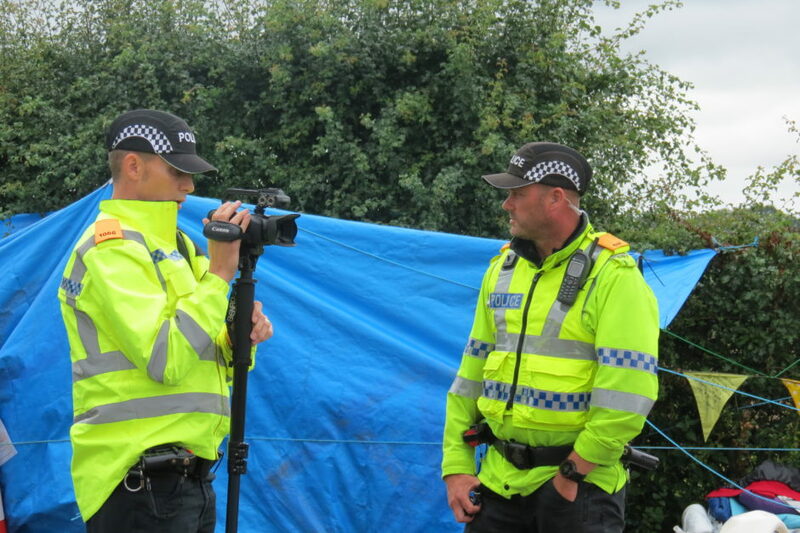 Channel is a voluntary programme aimed at people identified as “vulnerable to being drawn into terrorism” and we had asked specifically about how often such referrals involved anti-fracking campaigners. In a series of extraordinary Decision Notices in 2016, the Information Commissioner had said releasing this information “would disclose that Prevent officers were targeting anti-fracking events for extremist activities” and provide “useful intelligence to anyone wishing to circumvent counter-terrorism arrangements surrounding fracking”. She also implied there was something suspect about Netpol asking for data from a number of different police forces. The Tribunal panel has rejected arguments presented last month by the police and the Commissioner. Its judgment says that although revealing whether the police hold this kind of information would “indicate a level of concern or watchfulness concerning anti-fracking campaigning as a movement”, this would not reveal anything new “that is not already in the public domain”. The panel added that it was “stretching credulity to contend that such confirmation would be of material assistance to terrorists or potential terrorists”. Now that the Tribunal has instructed all five forces to go back and look at our freedom of information requests again, the police can no longer simply fall back on a standard “neither confirm nor deny” response to avoid saying whether opponents of fracking were ever considered vulnerable to the influence of so-called “extremists”. We hope that as a result of losing this case, the Information Commissioner will finally adopt a more positive stance on ensuring the public are not shut out completely from the debate about the effectiveness (or otherwise) of counter-terrorism and policing policy. Netpol’s legal challenge is a reminder, too, about the importance of interventions by campaign groups and the increasingly shrinking space available for organisations to demand accountability from the police and state. Working with our lawyers, it has taken two years to obtain today’s judgment, in the face of stonewalling from the police and the regulator responsible for freedom of information. An individual working on their own would have found it far more difficult find the time and resources to pursue a case for so long. The Tribunal judgment is available here.